In 1872 the Christ Church College Cathedral belfry showed damages which made it necessary to rehouse its bells elsewhere. Driven by Dean Henry George Liddel, the New Belfry project started in 1872. 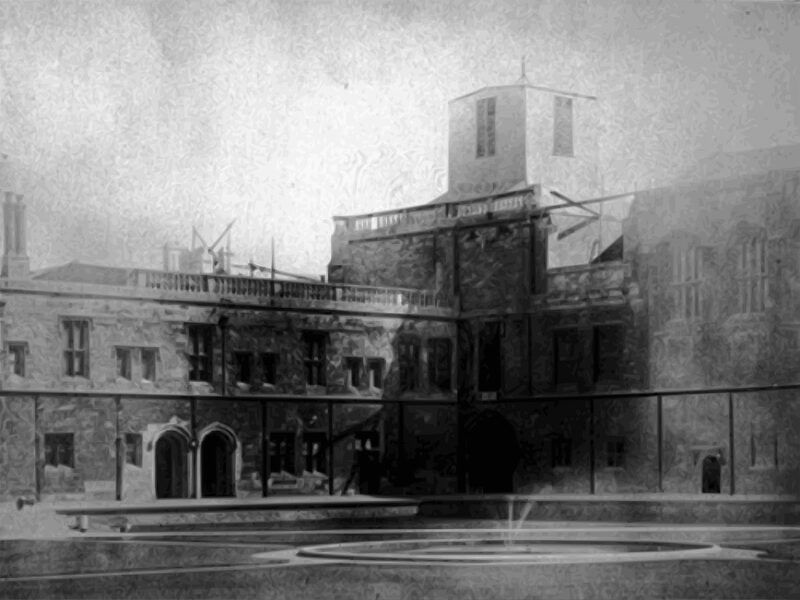 The new bell tower was to be placed at the top right corner of Tom Quad, above the staircase to the dining hall. Alas, money run out and a very simple big wooden cube served as the new temporary belfry. It was so simple that C.L. Dodgson associated it with, among other shapes, a new design pattern for bonnet-boxes and bathing-machines (MG025). Later that economy belfry shyly went into hiding behind the walls we can see today (right image, built from 1876 to 1879). The idea has spread far and wide, and is rapidly pervading all branches of manufacture. Already an enterprising maker of bonnet-boxes is advertising ‘the Belfry pattern’: two builders of bathing-machines at Ramsgate have followed his example: one of the great London houses is supplying ‘bar-soap’ cut in the same striking and symmetrical form: and we are credibly informed that Borwick’s Baking Powder and Thorley’s Food for Cattle are now sold in no other shape. 101 “Other maps are such shapes, with their islands and capes! There are suggestions that the Bell in The Hunting of the Snark might be interpreted as a symbol for time and time pressure. I think that it also might have been used by C.L. Dodgson to continue lampooning Dean Henry Liddell‘s belfry project. In his annotation MG047 to the preservation of the “symmetrical shape” of a boiled Jubjub, Martin Gardener did not consider that it might be a reference to the “symmetrical form” in § 7 of The New Belfry of Christ Church. In a tweet by “Tower Poetry” you can see how that temporary bell tower looks today. One small part of Dodgson’s work, though, has impressed social scientists: his analysis of the mathematics of voting. His interest in the topic was sparked by the deliberations of his colleagues at Christ Church over such matters as how to choose a new belfry. Dodgson’s pamphlets on voting were largely ignored until 1958, when a British economist, Duncan Black, noticed that there had been nothing so good on the topic since just after the French Revolution. 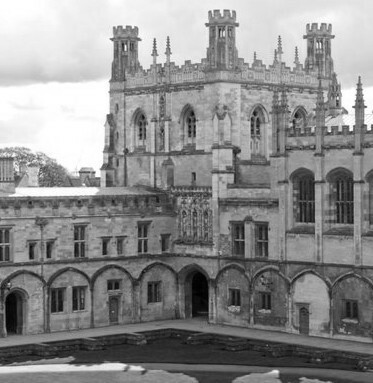 Ostensibly, [Dodgson] was pondering the best way for the governing body of Christ Church, Oxford, where he was a tutor in mathematics, to decide on the design for a controversial belfry, and to pick new members of the college. […] For college elections, Dodgson first proposed a version of Borda’s method, and also a version of Condorcet’s (though he appears not to have known about Borda’s and Condorcet’s work). Later, he developed an interest in politics beyond the walls of Christ Church, and, in the eighteen-eighties, he tried to find ways to secure equitable representation in Parliament for minorities. Dodgson’s method of taking votes on more than two issues (1876) attempts to find winners in case initially there is no winner. The method was applied at Christ Church college for a small number of candidates. However, for large lists of choices, the rearranging of candidates (until a winner is found) requires a computing power which surely was not available then. And even today it is a challenge (see McCabe-Dansted below).